An unconnected pile foundation allows separation between the lower pile and the pile cap, and it has been proposed as an effective foundation type for reducing the seismic load during strong earthquakes. However, previous quantitative evaluations of unconnected piles with various foundation types and earthquake intensities are inadequate. 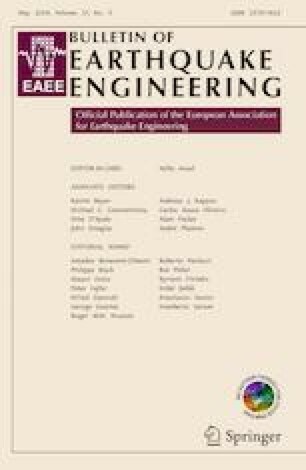 In this study, the influence of base shaking level and the material of the interposed layer between pile and pile cap on the seismic behaviour of unconnected piles were evaluated using a centrifuge model test to reproduce the field stress conditions. A dynamic centrifuge model test was completed on an experimental model consisting of dry sandy soil, a foundation and a single degree-of-freedom structure. The acceleration of the structure and the settlement of the foundation system were measured during base shaking. For the unconnected pile system, the structural seismic load reduction effect due to rocking behaviour was confirmed, and the unconnected pile foundation with the interposed layer with large stiffness had less vertical settlement than the conventional shallow foundation. Finally, the rotational stiffness and damping ratio for the foundation system used in the centrifuge model tests were derived and discussed. This research was supported by a Grant (030401) from the Infrastructure and Transportation Technology Promotion Research Program funded by the Ministry of Land, Infrastructure and Transport of the Korean government. This research was also supported by the National Research Foundation (NRF) of Korea Grant funded by the Korean government (MSIP) (No. NRF-2015R1A2A1A15054531). The authors acknowledge the KREONET service provided by the Korea Institute of Science and Technology Information.